Futuristic, space, dystopian, post-apocalyptic, alien, it’s all here. Ah, another “modern Prometheus” evil experiment movie. You seldom go wrong with a lab coat and nefarious doings in a basement lab. Enter, The Kindred, a movie with dollops of backstory and erudition to spare — usually the opposite in these kinds of things, especially ones filmed on the cheap. Dr. Amanda Hollins’ life work lurks in bubbling Florence flasks and mysterious beakers in a dark subterranean lair.After all, that’s where the very best biomedical research labs are, let’s be honest. Dr. Hollins had a falling out with evil Dr. Lloyd (Rod Steiger) over the direction of their controversial gene-splicing research. She has moral scruples, he decidedly does not. Hollins is not long for this earth, and issues an edict to son John to destroy the fruits of her labors before they get into the wrong hands. 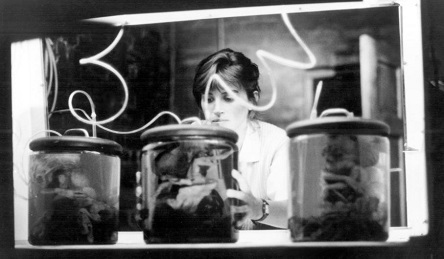 John and a bunch of grad student buddies head to her home and basement lab to do her bidding. But things are never cut-and-dried. There’s a young Hollins acolyte among them, Melissa, who is keen on preserving the doc’s research for posterity. It’s what the group eventually find in the lab that inspired the title, The Kindred, and what adds another appendage to the Hollins family tree. 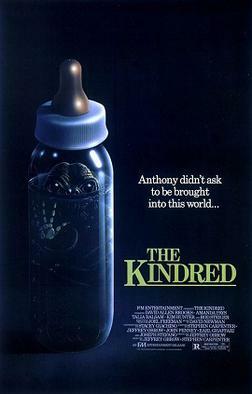 The movie’s baby bottle fetus poster is undoubtedly etched in the memories of seasoned gore hounds, even if they never got around to actually watching The Kindred (it wasn’t exactly a breakout smash in 1987). Still, with slimy creatures, savvy, smarts, infidelity, and grave-robbing, The Kindred has the makings of a 19th century novel! (turns out Dr Lloyd is in cahoots with a body snatcher who passes him near-dead bodies). Rod Steiger chews the scenery like nicotine gum, but regardless…it’s a fun role, and Amanda Pays (above) is dynamite as grad student/temptress Melissa. Fans of ’50s monster movies will be delighted as there are definite nods to flicks like The Brain that Wouldn’t Die and countless others. Any time any some monster hunts down eggheads, Jack Arnold’s estate should get a royalty check. 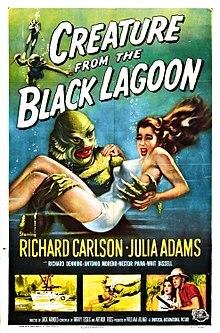 The flick he directed, Creature from the Black Lagoon casts as many shadows as its Florida everglade locale. It’s almost inescapable/inestimable how influential this movie is. Whether it’s drek like Luigi Cozzi’s Contamination, or fan favorite Steven Spielberg’s Jaws, it doesn’t matter. You put researchers on board a vessel investigating something weird, things go haywire, and it all goes back to Creature. Hell, the underwater swimming shots here are totally Jaws and the good ship Rita is the bigger boat. Creature from the Black Lagoon has simple, effective storytelling that found its way into the above, and hundreds of other films both sci fi and natural horror/animal attack: strange find, experts called in, search party sent out, warning signs ignored, or some variation thereof. A geologist discovers a strange fossil sticking out of a sandbank along the Amazon. With very little care for its preservation, he hacks it loose with a pickax and hoofs it over to the lab. His colleagues don’t know what to make of it, but in the interest of science, champ at the bit to go looking for its origins downriver. They hire a sleazy sea captain to pilot a dilapidated vessel down river, Joseph Conrad-style. And what do you suppose they find? Creature was Stephen King’s earliest movie memory. Audiences in the 50s must’ve been wowed by the effects, which were undoubtedly cool for their time. And it’s a riot to think a silly film like this came out of Citizen Kane, of all things. CK’s producer William Alland was at a dinner party for Kane, and overheard a…guess you could say “fishy” tale about some odd fish/human hybrid. Hence, Creature was born. Incidentally, if readers would like to hear us talk about that very thing, check out our podcast discussion of Creatures from the Abyss and Island of the Fishmen! 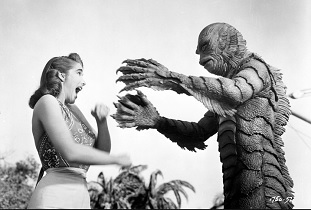 Creature from the Black Lagoon is a joy. Its sequel, Revenge of the Creature, featured Clint “the Squint Eastwood” in his film debut as a lab geek.